Click here to view the auction. This painting was sold, and is now in the collection of valliant66. Thanks to all who bid! Fake Steve Job's blog has been getting a lot of press lately. For the longest time no one knew who was behind the humourous and entertaining posts. Recently, the mysterious author was revealed. It turns out that Daniel Lyons, senior editor of Forbes magazine, is the real man behind the curtain of Steve Job's Secret Diary. 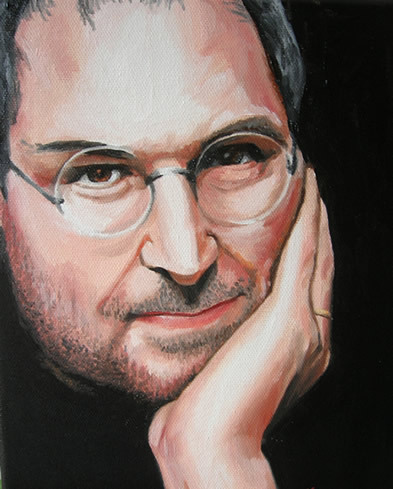 Who knows, maybe you'll be bidding against the Real and the Fake Steve Jobs for the painting! I'm sure both of them will want to get their hands on this beautiful painting! Snaggy and I did this comic about Fake Steve Jobs in this JoT, enjoy! 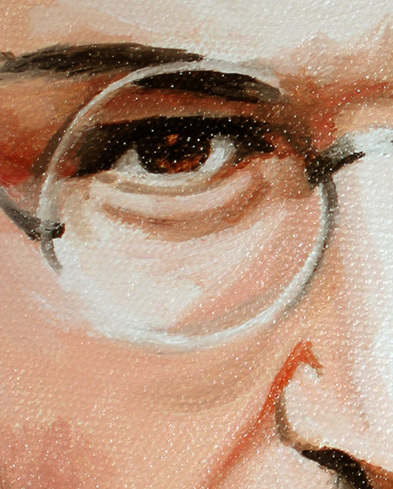 Details: "Fake Steve Jobs" is Nitrozac's 29th painting of her Painting Blog. It's an original oil painting, on 8 x 10 inch stretched canvas. The painting will be dry and ready to ship a couple weeks after the auction ends, depending on the drying conditions and such. The back of the painting will contain the title, the date painted, Nitrozac's signature, and a fingerprint for authenticity. If the painting isn't sold at auction, it will be up for sale in our webstore at a higher than originally listed price, so it does pays to bid on the auction! Best of luck to all bidders! Shipping for each painting is extra... to the US and Canada it is 8 dollars, to other locations, 15 dollars.